Businesses using the fuel-electric Genie Z- 60/37 FE articulating boom lift since its global launch in April 2016 have been able to cut costs and their carbon footprint, while getting increased performance and versatility from their aerial work platforms. 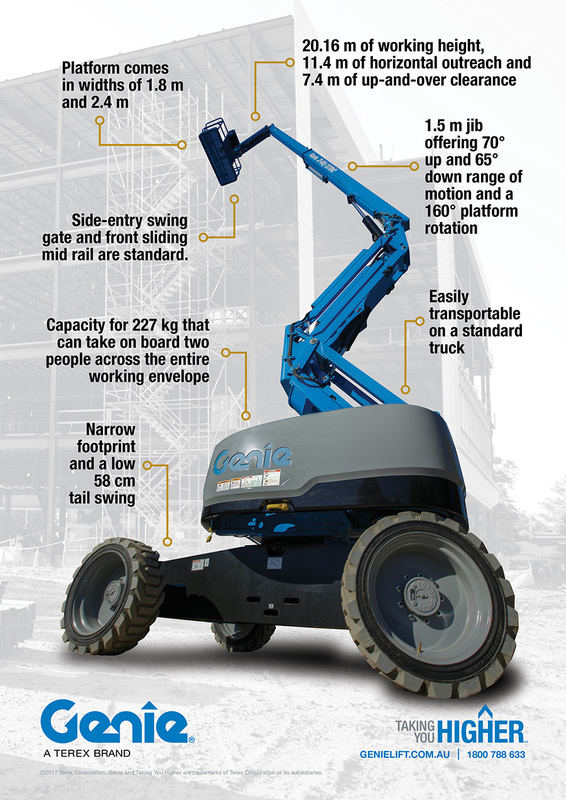 When operating in full-electric mode, the Genie Z-60/37 FE boom lift offers a full day of emission-free performance on a single charge, and in hybrid mode it runs for more than a week on a single tank of diesel. In hybrid mode, an environmentally friendly 24-hp diesel powered generator constantly monitors the charge of the 48V DC battery pack, keeping it topped up and then automatically shutting off to minimise fuel consumption. In extreme battery usage conditions or after heavy full-electric operation, the hybrid power system can provide a bulk charge in around 4 hours. When an operator is climbing hills, or taking on rugged terrain, the hybrid system can provide power directly to the AC motors, combining the power of the diesel-driven generator and the 48V DC battery pack. “On long-term jobs, even when on-site power is not available, this machine is versatile enough to handle tasks ranging from work on rough and unprepared ground to indoor applications where it’s important to keep noise and emissions to a minimum,” said Lawrence. The Genie Z-60/37 FE boom lift is equipped with foam-filled, non-marking all-terrain tyres, adding to the machine’s versatility for outdoor and indoor uses. Another brilliant feature of this boom is the Genie FastMast™ system. This function enables the boom to be moved from full height to below grade and back, shortening ground-to-top lifting time with the use of just one boom control. “It enables operators to vertically track walls by simply raising or lowering the secondary boom without needing to re-position the machine,” said Lawrence. The fuel electric Genie Z-60/37 FE articulating boom will be on display in May at HIRE 17 Convention in Sydney, and will be available in Australia in Quarter 2, 2017.